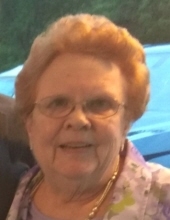 GROSSER, Ellen L. - Age 81, of Fenton, died Monday, March 18, 2019. Ellen was born February 4, 1938 in Chicago, Illinois, the daughter of Walter and Esther (Pearch) Graham. She married William Grosser in 1977. Ellen received her Associates Degree from Mott Community College and worked at Crestmont Medical Care as a Registered Nurse until her retirement in 1992. She was a proud and active member of Transfiguration Lutheran Church, enjoyed sewing and spending time with her grandchildren. Ellen was a loving mother, grandmother, and friend who will be missed dearly by all who knew her. Ellen is survived by her children: Joseph (Leighanna Nichol) Wilson of Fenton, Charles (Jody) Wilson of Pinckney, Michael (Paula Pearsall) Grosser of Corinth, Texas, Doreen Ahern of Linden; twelve grandchildren; and thirteen great grandchildren. Ellen was preceded in death by her parents and husband, William. To send flowers or a remembrance gift to the family of Ellen L. Grosser, please visit our Tribute Store. "Email Address" would like to share the life celebration of Ellen L. Grosser. Click on the "link" to go to share a favorite memory or leave a condolence message for the family.